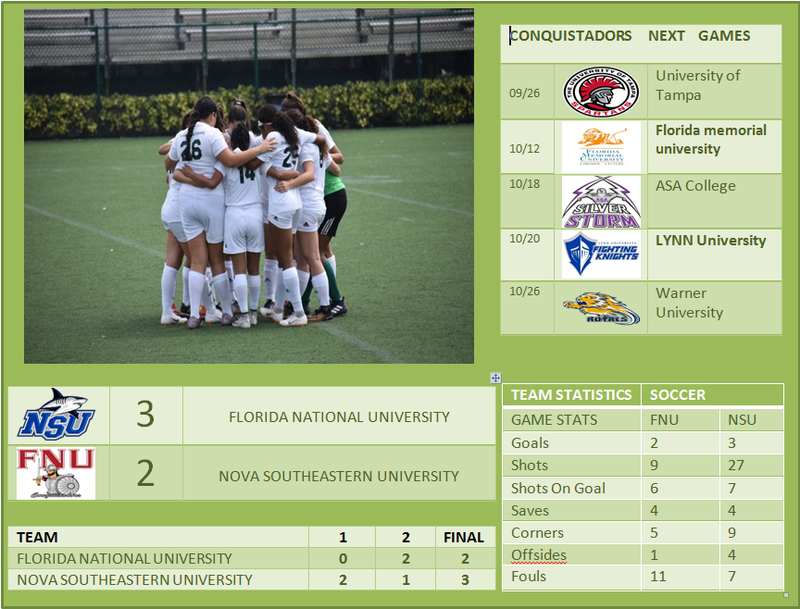 FORT LAUDERDALE, Fla. – With an excellent performance in the second half of the match, FNU lost a thrilling match in Fort Lauderdale in a match against a strong team of NOVA Southeastern University. Location: NSU Soccer Complex | Fort Lauderdale, Fla. The Sharks controlled the tempo from the opening kickoff and climbed in front 1-0 in the 20th minute when a through ball from Russel ricocheted to the feet of Hannah Christophe, who hammered home her second goal of the season. Nova Southeastern would need only another 1:40 before doubling its lead. Russel once again led the charge for the Sharks’ offensive attack, this time finding Holman streaking down the right wing before beating the Florida National keeper with a strike into the low, right corner of the net. Still comfortably ahead 2-0 in the 68th minute, the Sharks threatened with a free kick from near midfield. A well-lofted ball played in by Russel was flicked on by Jessica Bonenclark right to Holman for an empty-net goal to extend the margin to 3-0. The Lady Conquistadors didn’t go quietly, however, as leading goal scorer D’Yolanda Pineda erased the shutout just 14 seconds later with the low score from about 30 yards out. The advantage was soon trimmed to 3-2 in the 80th minute after Isabela Martins drilled a free kick into the upper 90. The Sharks would keep their poise, though, and hold on down the stretch in their final non-conference match of the regular season. Friday’s multi-goal effort marked the second this season for Holman after doing so earlier this month against King. Friday’s meeting was the first all-time between both programs. FNU WOMEN’S SOCCER takes the weekend off before returning to play on the road next Wednesday at 7 p.m. against the University of Tampa For complete coverage of the action, visit the schedule or follow the Conquistadors on social media.